Most joint injuries heal better and faster if the injured joint can be used while being protected against further injury. This concept is the basis of “functional management” and is the principal behind the innovative designs of Aircast devices.Functional management is the treatment of choice for improving outcomes, enhancing patient quality of life, and reducing health care costs. Aircast pioneered the functional management of ankle sprains by developing the Air-Stirrup® Ankle Brace— now the standard of treatment. Building on this philosophy, the Aircast PneumaticWalker™, FoamWalker™, SP-Walker, and the Leg Brace are designed to provide functional management for injuries of the foot and lower leg. 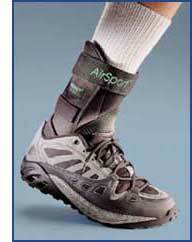 Research confirms that the functional management of injuries, using Aircast devices, produces superior results. The therapeutic benefits of graduated, pneumatic compression are the foundation of the exclusive Aircast Duplex™ aircell design. This patented design is constructed of two overlapping aircells that massage the injured area, milking away edema and reducing swelling. Because the Aircast Duplex™ aircell design is seamless, it provides consistent, uninterrupted compression without space between compartments where edema can collect. 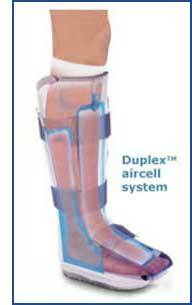 The Duplex aircell design is the cornerstone of the Aircast Air-Stirrup, PneumaticWalker, and FoamWalker.Aircast also applied the science of compression to the treatment of deep vein thrombosis (DVT) with the development of the VenaFlow® system. It is designed to employ graduated, sequential compression to move more blood faster and be more comfortable than any other known device for the prevention of DVT. Since 1978, the Aircast Air-Stirrup Ankle Brace has been the “standard of care” for the functional management of ankle injuries and has been cited in over 100 medical journals for its superior performance in helping to heal ankle injuries. All Air-Stirrup Ankle Braces (except for the pediatric model) come with a patient guide providing information on brace application and optional rehabilitation exercises. The Standard (Large), Training (Medium), and Small size Ankle Brace is available individually or as part of an ankle sprain kit. The Pediatric Ankle Brace is designed for children 2 to 6 years of age and is ideal for ankle stabilization in hemophilia patients.